Raul grew up between El Paso and Ciudad Juarez, Mexico, and his drawings often reference the landscape, buildings, and characters from his childhood. 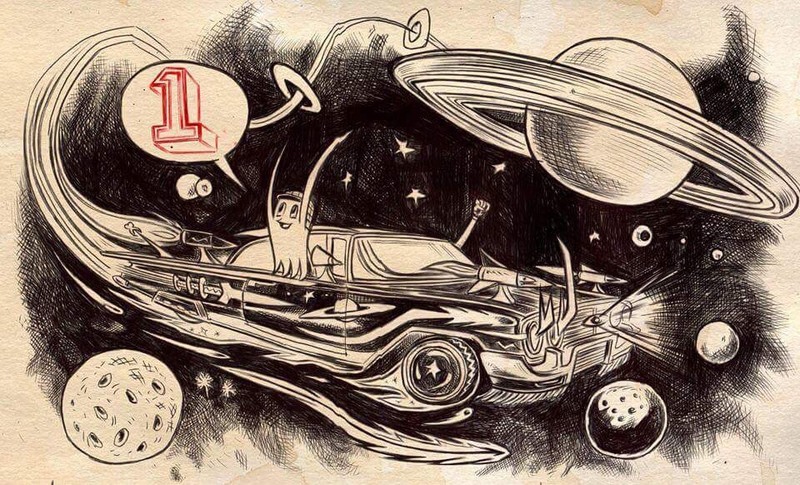 Raul’s work on Lowriders in Space is done completely in ballpoint pen, a decision to reference his first tools as a young artist, often making fan art of comic book characters. For this interactive exhibition at Cuchifritos, Raul’s original illustrations from the “Lowriders” series will be installed in allusion to newsstand vendors’ displays in Ciudad Juarez, along with a wall that will be available for visitors to the gallery to draw characters from the series or create their own. This project is the second installment of Sweety’s Radio: Edición Especial, on view through July 30, 2017. Raul the Third is an award winning illustrator and artist from El Paso, Texas. He is the 2017 winner of the Pura Belpré Illustrator Award for his work on the critically acclaimed children’s book series Lowriders in Space from Chronicle Books which he co-created with author Cathy Camper. Lowriders in Space follows three friends Lupe Impala, El Chavo Flapjack, and Elirio Malaria who work in an auto body show and have dreams of entering a car competition. They find creative solutions to build a lowrider, and the journey takes them outside of the planet’s atmosphere. Cuchifritos Gallery + Project Space is a program of Artists Alliance Inc., a 501c3 not for profit organization located on the Lower East Side of New York City within the Clemente Soto Vélez Cultural and Educational Center. Cuchifritos is supported in part by the New York City Department of Cultural Affairs in partnership with the City Council. This program is made possible by public funds from the New York State Council on the Arts with the support of Governor Andrew M. Cuomo and the New York State Legislature and the National Endowment for the Arts. We thank the New York City Economic Development Corporation and individual supporters of Artists Alliance Inc for their continued support. Special thanks go to our team of dedicated volunteers and interns, without whom this program would not be possible. For more information, visit artistsallianceinc.org.